Getting all the necessary vitamins and minerals your body needs from food alone can be difficult, frustrating and confusing. Cover your bases with a high quality daily multi vitamin and mineral supplement which delivers the most important nutrients at optimal dosages so you can just get on with your day, confident that you've done your bit. 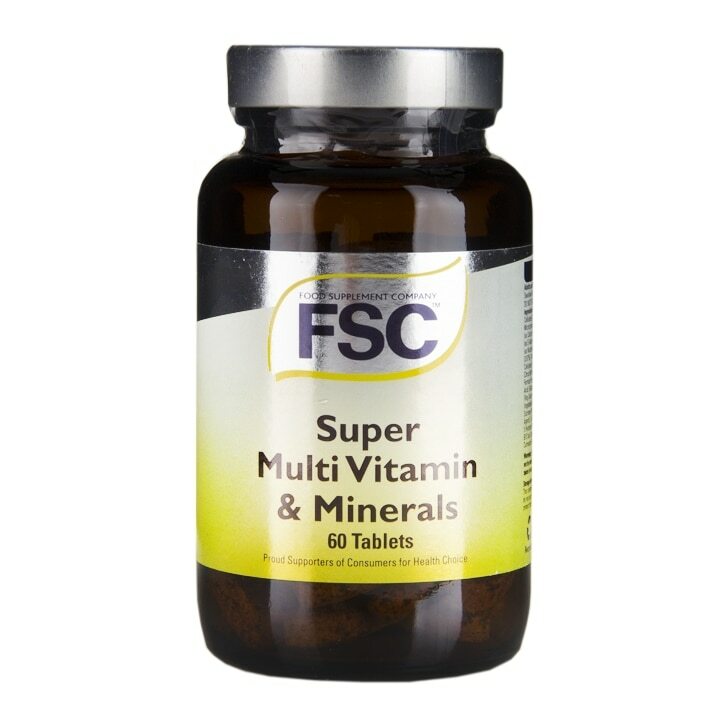 FSC's Multi Vitamins & Minerals tablets are high potency and sustained release to support your body's natural processes. Calcium Carbonate, Vitamin C, Bulking Agent: Powdered Cellulose; Potassium Phosphate, Choline Bitartrate, Stearic Acid*, Beta Carotene prep. (Anti-oxidant d-alpha Tocopherol), Calcium Pantothenate, Vitamin E (as d-alpha Tocopherol), Niacin (as niacinamide), Magnesium Oxide, Vitamin B6, Para Amino Benzoic Acid, Thiamine, Riboflavin, Inositol, Iron **, Zinc , Vitamin B12, Betaine Hydrochloride, Lemon Bioflavonoid Complex Powder, L-Methionine, Glutamic Acid HCl, Manganese** , Anti-caking Agents: Silicon Dioxide, Magnesium Stearate*; Potassium Chloride, Glazing Agent: Hydroxypropylmethyl cellulose; Hesperidin Powder, Biotin, Rutin Powder, L-Selenomethionine, Copper**, Co Q 10, Folic Acid, Chromium**, Potassium Iodide, Trace Mineral Complex. *Vegetable Source. **Chelated with Hydrolysed Vegetable Protein.